What is the VIP Turtle Feeding Experience? What's included in the VIP Turtle Feeding Experience? How long does my VIP Turtle Feeding Experience last? Are there any restrictions to complete this experience? What's the maximum number of individuals who can complete this experience? Do you offer a spectator ticket for the VIP Turtle Feeding Experience? What type of turtle do you feed in the experience? Can I purchase a gift voucher for this experience? Do I have to bring anything for this experience? -Time 'behind the scenes' to meet one of our knowledgeable Aquarists and learn more about Molokai, our giant green sea turtle! -Briefing to learn about feeding techniques and our turtle's vegetarian diet. -See where the Aquarists feed all the creatures in the Ocean Tunnel and carry out our turtle's feed! -SEA LIFE goody bag with plush toy to take home. -Please note there is a minimum age restriction of 12 for this experience.  -Guests under 16 years of age must be accompanied by one, free adult over 18 to supervise (who must hold a valid SEA LIFE Birmingham entry ticket). Proof of age may be required. Please see full terms and conditions on the booking page.